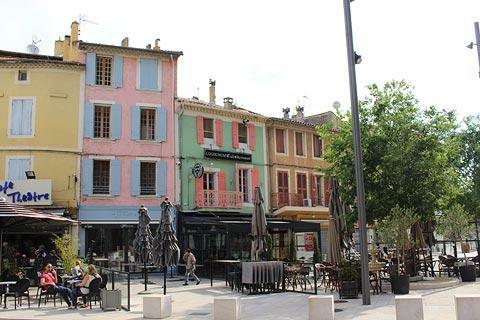 The town of Orange is found towards the north-west of the Vaucluse department of Provence, and is north of Avignon in the lower Rhone Valley. It is on the Meyne River, a tributary of the Rhone. Although best known and most visited for its Roman monuments, the town of Orange has other sites of interest including a cathedral and a historic town centre so allow time to explore. France This Way comment: the town centre of Orange is pleasant to explore but less interesting than certain towns in the region such as Avignon, Nimes and Aix-en-Provence so we suggest you stay in one of those towns, and visit Orange as an excursion if you are interested in seeing the Roman monuments. 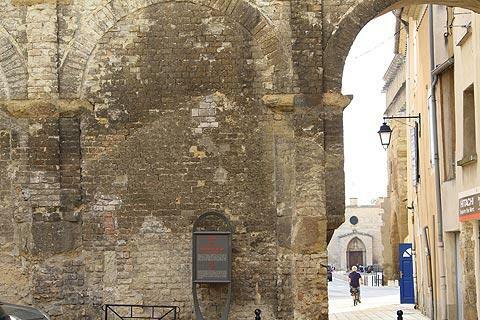 The two monuments of Roman architecture, the Ancient Theatre and the Triumphal Arch, are central to your visit to Orange. 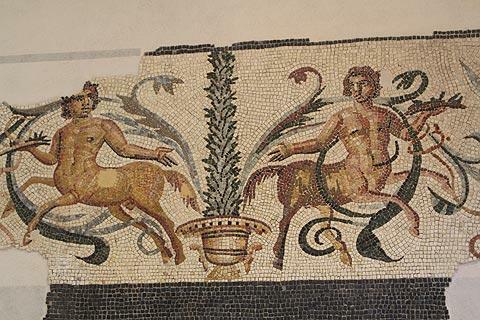 Both have been very well conserved over the centuries, and have been the subject of extensive studies to identify all the symbolism they contain, above all that of the Triumphal Arch. 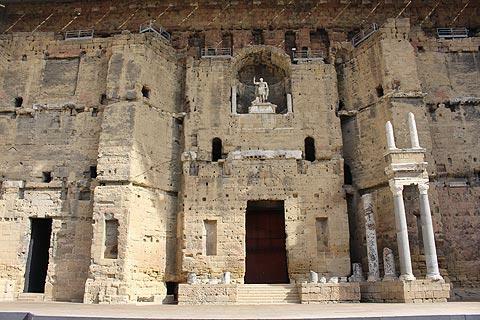 The Ancient Theatre in Orange is one of the best conserved Roman monuments in France, and the most important of the two Roman monuments in Orange. It is on the southern edge of the town centre. The Roman Theatre, at 37 meters high and over 100 metres long is in fact among the best preserved artefacts of the Ancient World. Also built in the Augustan period, it has almost perfect acoustics. The stage is in very good condition and very high, and only the original decorations have disappeared. 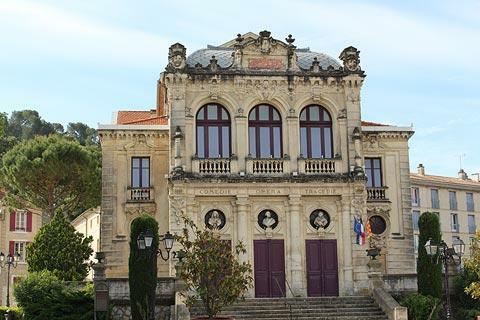 The theatre can hold almost ten thousand spectators and opera performances are still held here. 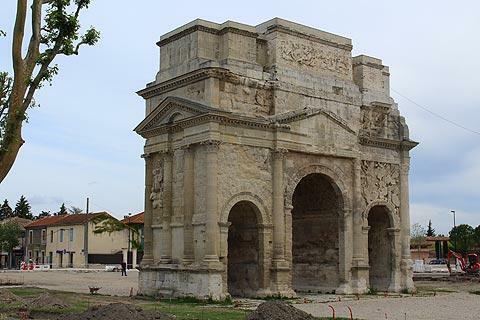 There is a great deal of interest here: see Ancient Theatre of Orange for details. The arch has a height of about 22 meters and a width of 21 meters, with three arches of which the Central Arch is the largest. 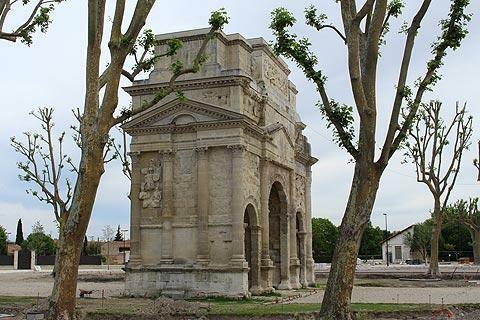 It is located on the ancient Via Agrippa (the Roman trade route from Lyon to Arles) and features numerous ornate carvings relating to the history of the conquests of Augustus, the Roman supremacy over the gauls and also various religious symbols. Opposite the entrance to the theatre in Rue Roche you can visit the Municipal Museum which contains many artefacts from the excavations carried out in Orange and surrounding area – note in particular the Roman cadastre from the time of Emperor Vespasian (9-79 A.D.), a remarkable marble slab engraved with the allocations of land, the sphinx and the mosaics. 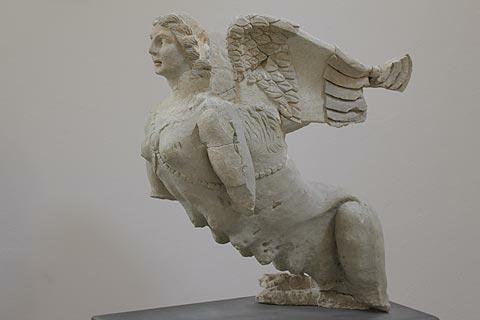 There are also prints, drawings, collections of old and medieval coins and some artefacts from the Theatre (for example, a fragment with scenes of Amazons, centaurs and nymphs); along with some remains from the Neolithic age which show that Orange was an area of ancient settlement; some Gallo-Roman ruins (it was at in the second century BC that the Gauls founded their village, at that time capital of the Cavaria tribe). 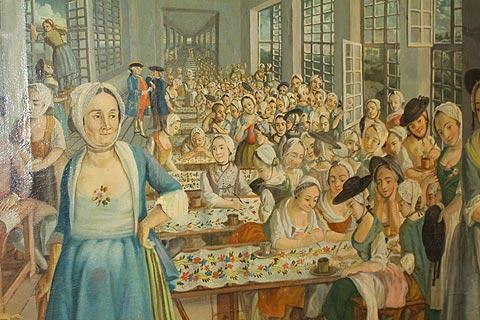 Various textiles and paintings can also be seen at the museum in Orange: we particularly liked the paintings showing life in the textile factories in the town in centuries gone by, with all the workers looking very happy in their work! Your ticket to the theatre includes access to the museum in the price, so we do recommend you take the time to visit. The Cathedral of Notre-Dame-de-Nazareth in Orange dates originally from the 4th century, was rebuilt in the twelfth century, and consecrated in the early thirteenth century. 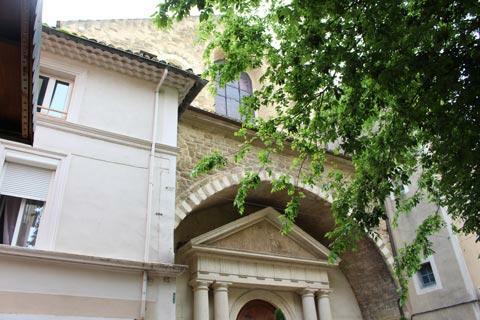 It is of Romanesque style, with one nave and lancet vaults and various decorations inside by Italian painters. Orange Cathedral has a long and troubled history; especially during the wars of religion when the church was sacked by the Huguenots and converted to the Protestant religion (1562), being later restored to Catholic worship in 1584. The Temple was also devoted to the ‘Goddess of Reason’ during the French Revolution and then again returned to the Catholic religion at the end of the Revolution. In terms of architecture and art in general the Cathedral is a real jewel. It has a single wide nave, with a twelfth century vault, and various richly painted chapels and sculptures. The broader fresco is one that represents the “Assomption de l'Arc Triomphale” (1819), by two Italian painters, Perattoni and Zanetti but the whole cathedral is filled with paintings which can be seen in various chapels. Some frescoes in the cathedral date from the sixteenth and the seventeenth century, with subjects that are not easily decipherable, while others have plant motifs, with acanthus leaves and also very beautiful mosaics (XIX century). There are also many examples of the neoclassical style to be seen, such as the portal to the West (1827). 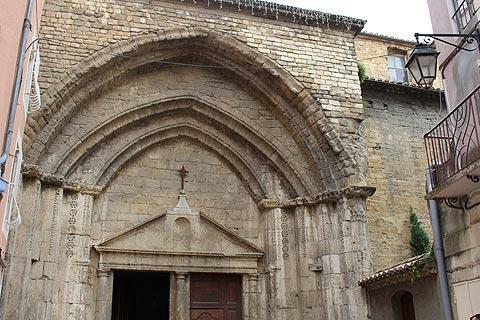 Other portals have very ancient styles, of Romanesque and pure Provençal style (XVI century). There are also some spectacular stained glass windows. 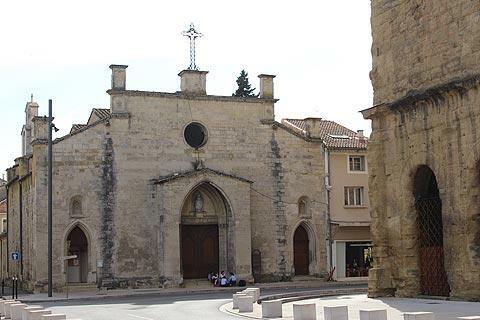 Another important stop is to see the 14th century Church of Saint Florent, founded by the Franciscans. It is simple and austere, according to the style of the Franciscan Order, with one nave, and contains the relics of St. Florent, a Bishop of Orange in the sixth century. Inside note the 17th century painting by of ‘The Virgin and the Child’ by F. Girardon de Troyes. 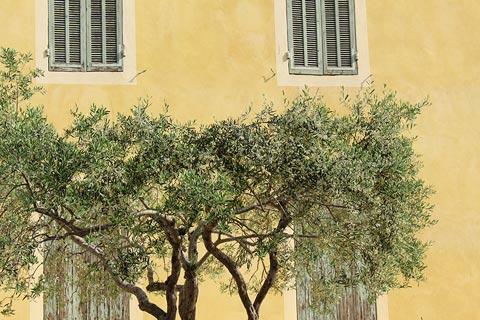 After seeing these monuments, you will find that Orange has quite a small historic centre but is a pleasant city to amble around, with various colourful painted houses to see. Naturalists will enjoy the opportunity to enjoy the beautiful park of the hill of St. Eutropia. Visit the Thursday market (or the Provençal market, in Rue de la Republique), where you can acquire some typical local food products, such as the justly famous Orange Muscat wine. Wines of the Rhone have been appreciated since ancient times, which, thanks to the particularly fertile soil, give us the famous red wines of the Rhone;: Orange is famous for its Chateauneuf-du-Pape wines but it also produces a remarkable variety of other local wines. 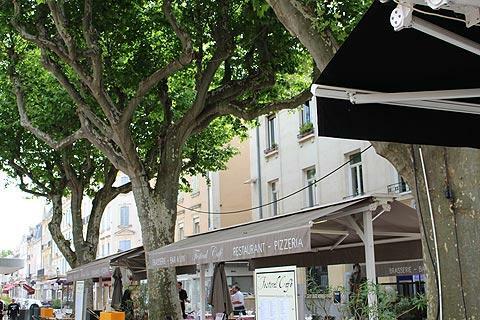 There is a great deal to enjoy in this region, and Orange is well placed for discovering historical Avignon a short distance to the south, the lovely countryside and villages of the Luberon to the east and also the Roman monuments at Arles and Nimes a little further south.